Everyone wants their children to look great in the clothes they wear. Some moms let their children choose their own clothes and some set their clothes out for them. In our home, both Ally and Cooper are in charge of whatever they want to wear, but they are starting to come into their own style and lucky for me, Paul Frank is part of that style. In 1995 a small Huntington Beach garage was buzzing with activity. Friends were busy hand sewing wallets and handbags with scraps of Naugahyde. Characters with whimsical names like Julius and Skurvy were created to decorate these accessories, originally made as gifts. Little did this small collective know, the unprecedented excitement and interest in these adorable characters would soon thrust their little company to overnight success. Paul Frank Industries fits perfectly into our day to day. My children are quite goofy and love wearing the monkey! 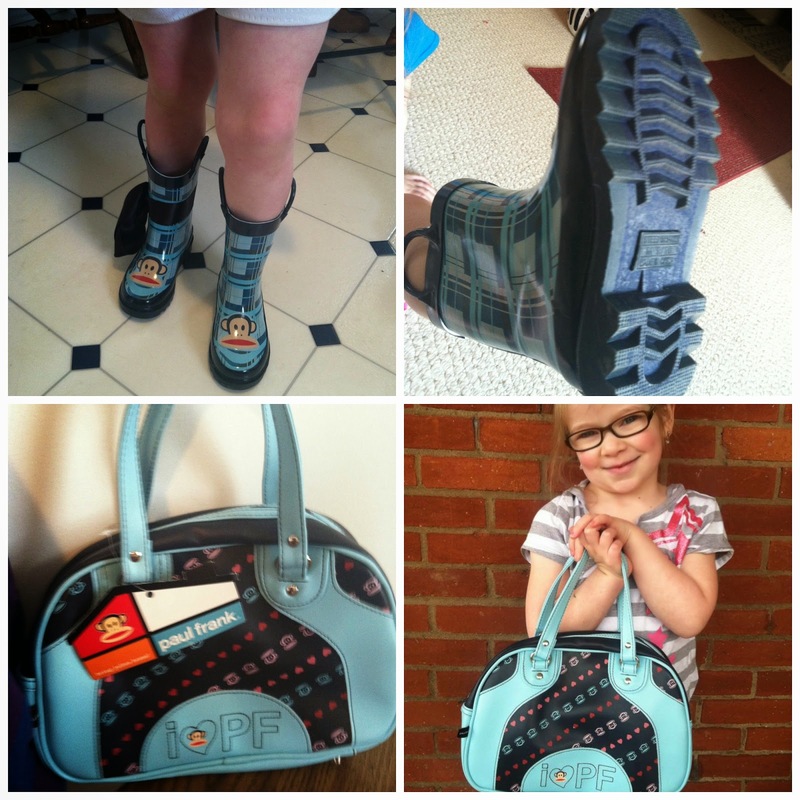 We were given a chance to review a couple of items from the Paul Frank line and WOW! I am impressed with this company! The quality is just what I need when I'm looking for a product for my children. Only the best for them! Along with these great shirts, Ally got to try out a new bag and galoshes! There isn't been a day where Ally has these boots on in the morning, or a trip outside the house that she hasn't brought her new bag! These rain boots have an amazing amount of tread on them. They're perfect for a slick surface while walking out in the rain. Of course you want to avoid that kind of situation, but Ally had no issue walking while wearing these boots! Her new Paul Frank purse fits her personality perfectly! I thought about keeping it for myself, but this little girl can be so persuasive with those eyes. So, this time she gets a new bag! For mom Paul Frank sent a tote bag that is perfect for any trip to the park, for a picnic or a fun afternoon at the beach! It is big enough to hold snacks, water, towels, a few books, I could go on. The fabric is thick and I can just tell this bag is going to last a long time. Again, great quality for a Paul Frank product! Its so easy to look great in Paul Frank products. They sell what you see here, but a lot more! Phone cases, Bedding, Furniture, Products for your pets and so much more can be found in their online store. You too can look as cool as Cooper if you give Paul Frank a try! My children already loved the monkey, but I can proudly say, Momma loves the monkey too! Fall in love with the monkey by looking in your local Target or online for more info! Disclosure: A special thank you to Paul Frank Industries for giving Sweet Cheeks and Savings this opportunity to work with them. We received these items free of charge from Paul Frank Industries. No monetary compensation was received or offered, nor were we under any obligation to write about this product. All opinions expressed are honest thoughts. We were not offering any sales or taking orders for this item. We will not receive any compensation in connection with any sales of this item. I'm actually not sure! Totally worth a look though! I can't find adult sizes on the website, but its possible they carry them at Target! Oh my heart! 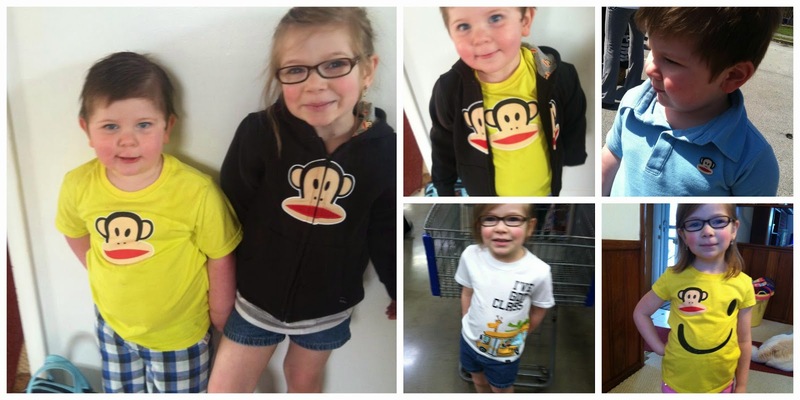 My kids have seen those monkey shirts and they want them! I just never knew where to find them! So cute! You should be able to find Paul Frank at a local Target! They're so cute! I love this little monkey and I didn't know they make so many cool things with it. I really like the purse and the rain boots. They are definitely something I would buy and wear myself. Everything is so cute! I love those boots, and the last picture of your little one is laugh out loud cutepreciousadorable. My kids love Paul Frank! What a fun review. Looks like your kids really enjoyed all the cute Paul Frank items. I love Paul Frank! It's such a fun design - the rain boots are great. I wonder if I could find a pair in my size?! Oh these are so very cute! I love monkey anything! I've seen that monkey logo before but never knew what it was from. Now I know! Oh, I love those little rainboots! How cute! those are just so cute and lovely! Oh my how cute. they are too adorable I love it. Paul Frank makes great quality clothing. I love the pics of your kids! I am now in love with the monkey. Your kids look so cool in their monkey gear! We are big Paul Frank fans - have you seen the custom phone cases yet - I just created one for my phone with a picture of my boys! 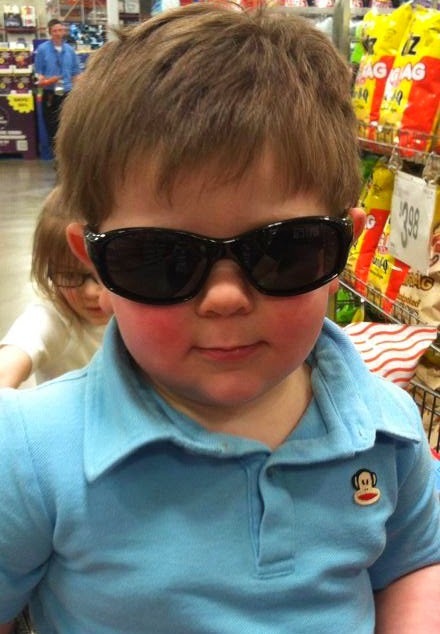 My youngest would love the sunglasses and the shirt your son has. I love the monkey and I want a pair of those boots for myself. Do they make them in adult sizes? This clothing would make great gifts. I absolutely love that monkey! SO cute and both girls and boys love it. I liked buying Paul Frank for my kids and glad they liked to wear it. It is comfortable with cute designs. Your kids are adorable. Super cute! Love that jacket with the monkey right down the middle of the zipper! Love the merch! They look so cute and adorable! I had no idea Paul Frank made clothing and shoes for kids. I always thought it was just adult everyday wear. I love Paul Frank. My daughter would adore that bag and rainboots.